During the three-year period from mid-2006 to mid-2009, national, provincial or local governments harassed or attempted to intimidate religious groups in 142 of the 198 countries or territories included in this study (72%). Harassment of religious groups by individuals or groups in society was even more widespread, occurring in 153 countries (77%). This section of the report looks at the harassment and attempted intimidation of particular religious groups. It is based on specific, publicly reported acts motivated by religious hatred or bias. It is important to note, however, that these data do not measure the severity of the harassment or intimidation, so it is not possible to say whether one religious group is harassed to a greater or lesser extent than other religious or ethnic minorities. Adherents of the world’s two largest religious groups, Christians and Muslims, who together comprise more than half of the global population, were harassed or intimidated in the largest number of countries.25 Over the three-year period studied, governmental or social harassment of Christians was reported in a total of 130 countries (66%), while harassment targeting Muslims was reported in 117 countries (59%). Buddhists and Hindus – who together account for roughly one-fifth of the world’s population – faced harassment or intimidation in fewer places; harassment of Hindus was reported in 27 countries (14%) and harassment of Buddhists in 16 (8%). In proportion to their numbers, some smaller religious groups faced especially widespread hostility. Although Jews comprise less than 1% of the world’s population, government or social harassment of Jews was reported in 75 countries (38%). Members of other world religions – including Sikhs, ancient faiths such as Zoroastrianism, newer faith groups such as Rastafarians and groups that practice tribal or folk religions – were harassed in 84 countries (42%). Some religious groups were more likely to be harassed by governments, while others were more likely to be harassed by individuals or groups in society. Muslims, for example, were harassed by government officials or organizations in 100 countries (51%) and by social groups or individuals in 84 countries (42%). Jews, on the other hand, experienced social harassment in many more countries than they faced government harassment. Harassment of Jews by individuals or groups was reported in 71 countries (36%), while government harassment of Jews was reported in 28 countries (14%). Christians experienced governmental and social harassment in about the same number of countries; they were harassed by government officials or organizations in 104 countries (53%) and faced social harassment in 100 countries (51%). 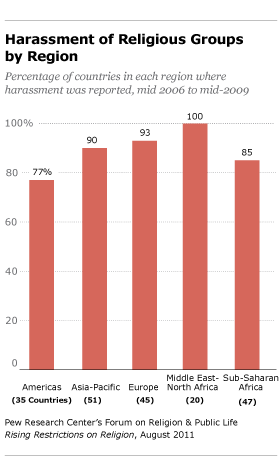 During the period from mid-2006 to mid-2009, harassment of religious groups was most widespread in the Middle East-North Africa, the region that also has the highest levels of government restrictions and social hostilities involving religion. There were reports of government and/or social harassment of religious groups and individuals in all 20 countries in the region. 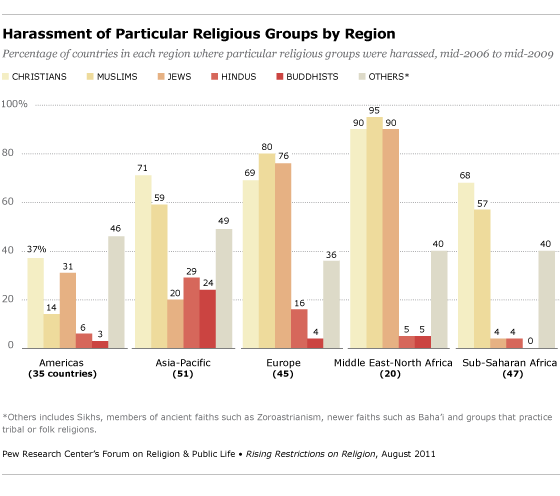 Religious groups also faced some form of harassment in 93% of the countries in Europe (42 of 45 countries); 90% of the countries in the Asia-Pacific region (46 of 51 countries); 85% of the countries in sub-Saharan Africa (40 of 47 countries); and 77% of the countries in the Americas (27 of 35 countries). Harassment of Christians, Muslims and Jews was highest in the Middle East-North Africa. Although this is a predominantly Muslim region, followers of Islam were harassed in an even higher percentage of countries in the region than were Jews or Christians. Buddhists and Hindus faced the most harassment in the Asia-Pacific region, the part of the world with the largest concentrations of these two religious groups. Muslims were harassed in 80% of the countries in Europe and more than half of the countries in Asia-Pacific (59%) and sub-Saharan Africa (57%). Christians were harassed in more than two-thirds of the countries in Europe (69%) and sub-Saharan Africa (68%). Christians also faced harassment in nearly four-in-ten countries in the Americas (37%). Jews were harassed in more countries in the Americas (31%) than Muslims (14%). In each region of the world, members of other world religions and groups that practice tribal or folk religions faced harassment in a substantial number of countries. Indeed, these groups were harassed in at least four-in-ten countries in the Asia-Pacific region (49%), the Americas (46%), sub-Saharan Africa (40%) and the Middle East-North Africa (40%). In Europe, such harassment was reported in a third of the countries (36%). In the Americas, followers of Native American faiths and adherents of other world religions were harassed in a larger share of countries (46%) than Christians (37%), Muslims (14%), Jews (31%), Hindus (6%) or Buddhists (3%).